With the local track and field season underway, athletes are already showing they are going to make an impact at the season-ending meets, with an eye on sending a record amount of competitors to the state championship meet at Middletown High School on June 7 and 8. In 2018, a total of 12 area athletes qualified for individual events at the championship meet. That group included Fonda-Fultonville’s Brittany Castelluccio, Johnstown’s Abby Gottung, Amsterdam’s Gabby Stanavich, Brenda Santana and Lauren Santiago, Broadalbin-Perth’s Chris Wagner, Sean Meher and Ava Tyler, Canajoharie’s Andrew Towse and Andrew Yacobucci, Galway’s Rachel Wnuk and Dolgeville’s Emma Bilinski. Amsterdam also sent its 4 x 400-meter relay team of Olivia Lazarou, Santana, Stanavich and Santiago. The Broadalbin-Perth boys captured the 2018 Foothills Council and Section II Division III championships and are looking to repeat the feat again this season. The Patriots lost key contributors Chris Wagner, Joe Vitalis, Marcos Viera, Evan Smith and Zach Johnson to graduation, but they return several key pieces from their championship team to make another title run. 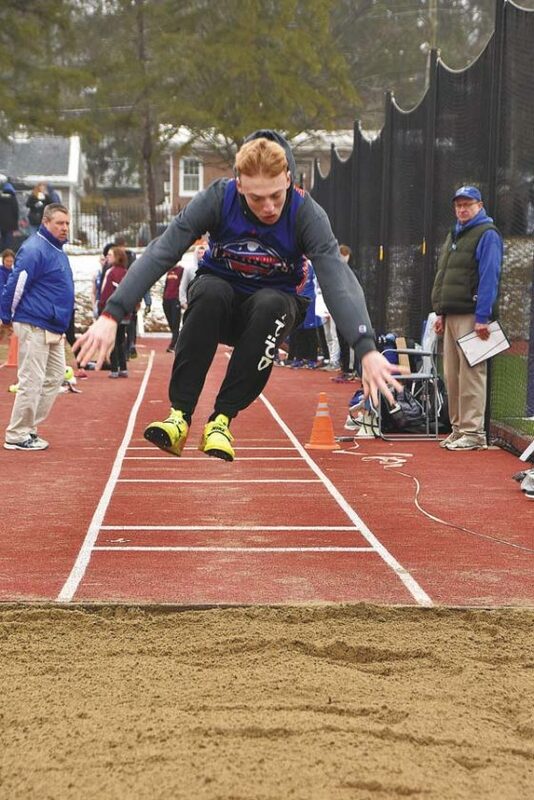 Senior Sean Meher qualified for the 2018 state meet in the triple jump and is coming off a strong indoor track season in which he earned berths to the state championships in the long jump and high jump. He placed 18th at the indoor championships in the high jump, clearing the bar at 6-0 and was 12 in the long jump with a leap of 21-1. Daniel Dylong returns and will be looking to improve on his third-place finish in the pole vault at the state qualifier as does Niko Mancini who was fifth at the qualifiers in the pentathlon. The Patriots also are looking for consistent point contributions from veterans Aidan DeJong, John Coddington, Jeff Shlomovich and Mike Cichy. The Lady Patriots pulled off a third-place finish at the Division III sectionals last year and are looking to move up in the standings. Hailey Parrotti who achieved an at-large qualifying distance of 36-13/4 in the triple jump at last year’s state qualifiers, returns for her senior season and is on track to make a bid for a berth at the state meet in the event. She is joined by Ava Tyler who went to the states last year in the pole vault, shot put and discus standout Caitlin Palmateer and cross-country state meet qualifier Gabby Larsen. Abby Gottung earned a berth in the 2018 state championships in the 400-meter hurdles and returns for her senior season at Johnstown. Gottung placed sixth in Division II at the state championships and is looking to lower her school record in the event. Molly Lake and Gottung have been members of the Lady Bills 3,200-meter relay team that has claimed the last two sectional championships and will be looking for the right combination to record a third-straight title. Senior Sebastian Mills and sophomore Sarah Smith went to the state championships last fall in cross-country and will be looking to ad the outdoor track championships to the resumes. Head coach Missy Kaszuba will be looking for contributions and leadership from Trey Stover, Joseph Matthews, Victor Orsell, Brady VanAernam, Mark Cwiakala, Nolan Hayes, Jake Wesley, Olivia Weiderman and Jenna Thompson. The Gloversville Huskies are set to open their new eight-lane track and field facility Tuesday with a Foothills Council meet against Johnstown. Distance ace Skyler Reed is coming off a victory in the 3,000-meter steeplechase at the season-opening Bi-County Invitational and is joined by veteran competitors Ryan Smith, Parker Simek, John Carpenter and Emran Abbas as well as newcomers Jack Bruce, Damian Brockhum, Dominick Proietti and Arron Sowle. Rhea Winter will look to continue to improve after a solid indoor track season as the Gloversville girls look for consistent point contributions from returners Katie Callen, Gabby Belknap, Jordan DeMagistris and Sidney DeMagistris and newcomer Erin Clark. “We are excited to compete for a league championship,” said third-year coach Cody Headwell. Gabby Stanavich is focused on making a fourth-straight trip to the state championship meet in the 100-meter high hurdles as the Amsterdam Lady Rams seek their fifth-straight Foothills Council South division title. Lauren Santiago is also looking for a return trip to the state meet along with Charli Beekman. Santiago, Beekman and Stanavich all competed at the indoor state championships earlier this spring. Rams coach Kevin Wilary has a group of talented returners to build around. Returning to the track for the Amsterdam boys are Trevor Dzikowicz, Trevon Joyner, Marcos Santiago, Cuba Fernandez, Angel Sanchez, Antonio Reyes and Chaun’J Ramos. “With many new athletes joining track this season, the Amsterdam boys look to do well in the Foothills South,” Wilary said. Fonda-Fultonville swept the Western Athletic Conference meet titles last year and will face some stiff competition as they look for a repeat performance this season. The Lady Braves will be without major point contributor and state long jump champion Brittany Castelluccio and several top competitors that graduated. However, a strong indoor season has coach Mike Benton optimistic about the season. “After a very good indoor season and a good recruitment year, we expect a high level of success in our program for this season,” he said. Returning for the Lady Braves are Alyssa Duval, Emilia Vardai-Davidson, Stella Williams, Giuliana Capparello, Madison Nichols, Krystal McSpirit, Anissa Mosconi, Haley Clear, Kimberlee Snell, Kaitlyn Gray, Delena James, Carolyn Cranker, Kianna Hanson and Amelia Petersen. The Braves return a solid base of athletes as they look to repeat as WAC meet champions. Trevor Cline, Angelo Canale Carter Petersen, Liam Viscosi, Erich Hesch, Shane Viscosi, Ryan Schopmeier, Gabe Mormile and Cody Hanson are among the many veterans on the squad that Benton will be looking to help bring a large group of newcomers along in the program. “A good recruitment year is producing a pool of talent to reinforce the strong base we already have from a championship indoor season,” Benton said. Despite losing state meet qualifiers Andrew Yacobucci and Andrew Towse to graduation, the Canajoharie boys squad is looking to regain its WAC championship meet title back from Fonda-Fultonville. Junior Marcus Johnson, who won the Division V triple jump title and placed second at the state qualifier leads a solid group of veterans for Stuttle. He is joined by Andrew Ferguson, Joey Nare, Logan Arduini, Luke Sunderland and Alex Sydow. The Canajoharie girls will be led by veterans Taya Yacobucci, Emily Mayer and Abby Smith. The Mayfield-Northville girls were runner-up to the Lady Braves at the WAC championship meet and are looking to take over the top spot this season. Mayfield-Northville will be looking for competitors to step up to fill voids left by the graduation of Hannah Coupas, and Emily Fraiser. Madison Relyea opens her sophomore season with three school records already in her name and will be looking to add more titles and records to her already impressive resume. Mikayla Myers, Fianna Halloran and Kira Williams return and hope to make the jump to the next level of competition. Kaytlenn VanHeusen, Delaney and Taryn LaFontaine and Jordan Miller look to add depth to the Mayfield-Northville squad. On the boys side, veterans Dylan Bumpus, who won the season-opening Bi-County Invitational pole vault title with a height of 12-9, returns along with Evan Lehr, Antonio Mannino and Bobby Quillan. The are joined by talented newcomers Jake Petoff, Britain Goodemote and Dawson Leach. A large turnout for the Fort Plain/Oppenheim-Ephratah/St. 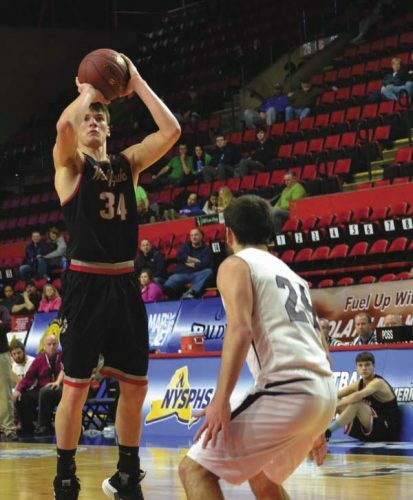 Johnsville squads brings depth to the returning talent this season. Seniors Sherry Huang, Quinn Jones, Calli Logan and Cara Porter return to lead the FPOESJ girls. On the boys side, seniors Hunter Logan, Patrick Murphy, Deegan Eggleston, Zach Mosher and Chris Swartz return to help FPOESJ continue to climb up in the ranks. Galway’s Rachel Wnuk will be looking for a return trip to the state meet in the high jump as she leads the Golden Eagles in search of a WAC title. She is joined by returning point-scorers Sara Ernst, Sam Grant, Kim LeCerais, Alia Bishop, Kim Martin, Allie Knizek, Gabby Shreen, Jade Sicluna and Natalie and Siela Zembasch. On the boys side, Holden Decker, who qualified for the cross-country state championships last fall, returns to the track, along with Charlie Clark, Adam Smith, Steven Mothon, David O’Connell, Josh Rumsey, Ryan Ingle, Peter Stewart, Matt Sowle, Nate Urban, Russell Cook and Darien Heigel. The Dolgeville Blue Devils had another strong turnout this season and will be looking to improve on the girls fourth-place finish and the boys fifth-place finish in the league. The Lady Blue Devils will be paced by Emma Bilinski who qualified for the state meet in the discus last spring, and returners Rylee Lamphere, Alexis Smith, Ryanne Williams and Leah Zilkowski. Coach Ashley Randall also is looking for point-production from newcomers Phoenix Longway, Nicole Congdon and Makenzie Bradseth. “We look to work hard and compete for a league championship,” Randall said. The Blue Devils also return a solid core of veterans including Dustin Benoit, Flynn Bliss, Zach Carpenter, Chyle Grossman, Owen Davies and Jacob Null. They are joined by talented newcomers Owen Castor and Jesse Bolster. “We hope to progress a young group of guys and be competitive in a tough league,” Dolgeville boys coach Matthew Randall said.